Route 66 put roadside businesses on the map. Those of us who are into truck driving know that America’s oldest highways are far more important than the consideration they receive. These roadways hold our country’s history. They helped develop our nation, for without them, we would have never migrated so actively from the east to the west. Without them, we would not have been able to transport supplies from the east to the west… wait for it… without them, we wouldn’t have our beloved trucking industry! Come on, ya’ll knew I was going there! Sure, we know America’s oldest highways present the historical accounting of the birth of our industry, but here’s something to think about: They’re also the crystal ball to predicting our future. Okay, admittedly you can’t exactly go sit in the middle of Route 66 with a fortune-teller and have her give you your driving fortune – and some might argue it’s better to listen to the aliens on that highway, anyway – but if you take a look at these old roadways, you’ll see how their past drives our future. Take a look at “America’s Oldest Organized Highway” the Yellowstone Trail. Conceptualized in 1912 and completed in 1920, this trail – literally, it was a dirt trail – led travelers from Boston all the way to Seattle. Americans dubbed the highway “a good road from Plymouth Rock to Puget Sound,” because they understood the need to for a safe transcontinental thoroughfare. What they didn’t think about was trucking, and truckers never could travel the dirt trails. As a result, the Yellowstone Trail is now gone. Enter the Lincoln Highway. Also running from coast to coast, the idea of the Lincoln Highway was conceived in 1912, as well. This gem in America’s oldest highways was originally funded privately, with cities, businesses and drivers paying the construction paving bills. When the United States government took over America’s highways in 1925, it divided the Lincoln Highway into U.S. Routes 1, 30, 40 and 50. Where the Yellowstone Trail failed, the Lincoln Highway succeeded, transitioning into an effective cluster of transportation corridors the trucking industry and travelers drive daily. The Lincoln Highway segues nicely into our next historical roadway because cities initially paid to pave the Lincoln Highway to encourage tourism – I LOVE a good segue – so, speaking of tourism, how about we all “get our kicks on Route 66”! Ah, Route 66… or “Will Rogers Highway”… or “Main Street of America”… or the “Mother Road”… or … what the…?!?! How many nicknames can a highway have? Anyway, before it was abducted by aliens, Route 66 was the main thoroughfare Americans used to escape the 1930’s Dust Bowl and to travel west to Los Angeles from Chicago. Entrepreneurs clued in and built successful businesses all along the route. For some reason, pop culture latched onto this stretch of roadway and featured it in movies, books and songs. The U.S. handed over Route 66 to the aliens… okay, I know, enough with the aliens! 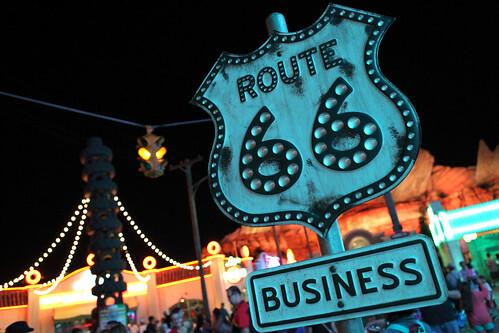 The U.S. removed Route 66 from the U.S. Highway System on June 27, 1985 – not sure why – but because of all its quirkiness, it remains a tourist fave, with countless vacationers driving the stretch each year. So, what does our highway past tell us about our highway future? Fortune-teller? We don’t need no stinkin’ fortune-teller! It’s simple. Dirt trails served their purpose for a very short period until Henry Ford’s Model T changed the way we thought and traveled. Once every American had to have a vehicle, they needed roads better than dirt trails to drive on. Once people moved west, they needed supplies shipped to them. Enter trucking and the need for better, stronger, faster six-million-dollar-man transportation corridors. Once we had better transportation corridors, people traveled more. Once people traveled more, they needed places to eat and stay… you get it! America’s oldest highways have taught us that as long as transportation evolves, highways must support the evolution. The success of our future highways and the businesses along them depends on it! Otherwise, they’ll suffer the same fate the Yellowstone Trail did. What’s left? One lowly sign in Hettinger, South Dakota… and that’s kinda sad!